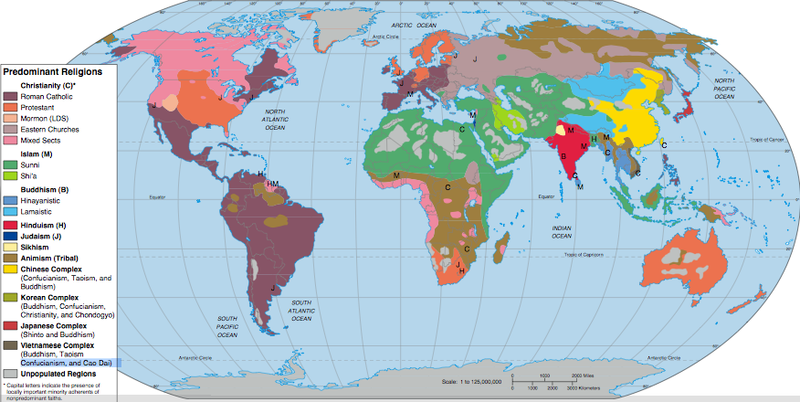 ^ 1.0 1.1 1.2 The Global Religious Landscape. 皮尤研究中心. 2012-12-18 [2014-08-25]. （原始内容存档于2014-08-28）. ^ Christianity 2014: Independent Christianity and Slum Dwellers. International Bulletin of Missionary Research（英语：International Bulletin of Missionary Research）. January 2014, 38 (1): 28–29 [2015-06-29]. （原始内容存档于2015-09-24）. ^ 4.0 4.1 2014全球差傳數據 (PDF). [2014-08-25]. （原始内容 (PDF)存档于2014-08-26）. ^ 皮尤調查：世界人口32%是基督徒 約1/3稱無信仰. [2014-08-25]. （原始内容存档于2014-08-26）. ^ 全球宗教人口58億 佛教徒占5億. 人間福報. [2014-08-25]. （原始内容存档于2014-08-26）. ^ 8.0 8.1 佛教人口分布. [2014-08-25]. （原始内容存档于2014-08-26）. ^ Peter Harvey. An Introduction to Buddhism: Teachings, History and Practices. Cambridge University Press. 2012-11-22: 5. ISBN 978-0-521-85942-4. ^ Ghanshyam Shah. Class, caste and community of South Indian industrialists: An examination of the Horatio Alger Model. Economic and Political Weekly, Vol. 20, No. 3: Economic and Political Weekly. 1985-01-19: 132–136 （英语）. ^ Robin Rinehart. Contemporary Hinduism: Ritual, Culture, and Practice. ABC-CLIO. 2004: 448. 9781576079058 （英语）. ^ 上座部巴利经典-转法轮经Dhamma cakkapavattana Sutta 互联网档案馆的存檔，存档日期2010-06-10. ^ 基本佛學第五課 四聖諦（一）苦諦. 中台世界. [2009-02-02]. （原始内容存档于2009-02-03） （中文（台灣）‎）. ^ 基本佛學第六課　四聖諦（二）集諦. 中台世界. [2009-02-02]. （原始内容存档于2009-02-03） （中文（台灣）‎）. ^ 17.0 17.1 基本佛學第七課四聖諦（三）滅諦、道諦. 中台世界. [2009-02-02]. （原始内容存档于2009-02-03） （中文（台灣）‎）. ^ Bhikkhu Sujato; Bhikkhu Brahmali. The Authenticity of the Early Buddhist Texts. Journal of the Oxford Centre for Buddhist Studies (牛津大學佛教研究中心). November 2013, 5. （原始内容存档于2015-04-21）. ^ James A. Benn; Lori Meeks; James Robson. Buddhist Monasticism in East Asia: Places of Practice. Routledge. 2009-09-10: 151–152. ISBN 978-1-134-00991-6. ^ Buddha Rising, Buddhism in the West, map. National Geographic Magazine. [2011-10-24]. （原始内容存档于2011-10-11）. ^ History of Religion. Maps of War. 2006-11-12 [2011-10-24]. （原始内容存档于2011-10-28）. 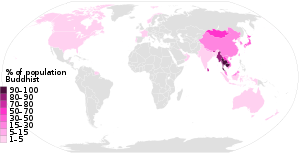 ^ Wads Worth - Religions in Asia. [2011-10-24]. ^ The Range of Religious Freedom. [2011-10-24]. （原始内容存档于2011-10-03）. ^ 皮尤调查：世界人口32%是基督徒 约1/3称无信仰. [2014-08-25]. （原始内容存档于2014-08-26）. ^ 61.0 61.1 全球宗教人口58億 佛教徒占5億. [2014-08-25]. （原始内容存档于2014-08-26）. ^ 張起鈞、吳怡. 《中國哲學史話》. : 頁三一〇. 鎌田茂雄. 《中國佛教通史》. 關世謙 譯. 台北: 佛光出版社. 1986. 周叔迦. 《印度佛教史》. 中華書局. 2004-11-01. ISBN 7101005446. 趙樸初. 《佛教常識答問》. 北京出版社. ISBN 7-200-04718-X. 方立天. 《中國佛教簡史》. 中華人民共和國: 宗教文化出版社. 2004. ISBN 9787801232281 （中文（中国大陆）‎）. 賴永海. 《中國佛教百科全書》. 中華人民共和國: 上海古籍出版社. 2000. ISBN 9787532528707 （中文（中国大陆）‎）. 任繼愈. 《中國佛教史》. 中國社會科學出版社. ISBN 7500401787. Cousins, L. S. The Dating of the Historical Buddha: A Review Article. Journal of the Royal Asiatic Society. 1996,. Series 3 (6.1): 57–63 [2007-07-11]. （原始内容存档于2010-12-24）. ; reprinted in Williams, Buddhism, volume I; NB in the online transcript a little text has been accidentally omitted: in section 4, between "... none of the other contributions in this section envisage a date before 420 B.C." and "to 350 B.C." insert "Akira Hirakawa defends the short chronology and Heinz Bechert himself sets a range from 400 B.C." Davidson, Ronald M. Indian Esoteric Buddhism: A Social History of the Tantric Movement. New York: Columbia University Press. 2003. ISBN 0231126190.
de Give, Bernard. Les rapports de l'Inde et de l'Occident des origines au règne d'Asoka. Les Indes savants. 2006. ISBN 2846540365 （法语）. Gethin, Rupert. Foundations of Buddhism. Oxford University Press. 1998. ISBN 978-0-19-289223-2. Harvey, Peter. An Introduction to Buddhism: Teachings, History and Practices. Cambridge University Press. 1990. ISBN 978-0-521-31333-9 （英语）. Lamotte, Étienne (trans. from French). Teaching of Vimalakirti. 由Sara Boin翻译 . London: Pali Text Society. 1976: XCIII. ISBN 0710085400. Skilton, Andrew. A Concise History of Buddhism. Windhorse Publications. 1997. ISBN 0904766926. Williams, Paul. Mahayana Buddhism: the doctrinal foundations. London: Routledge. 1989. Armstrong, Karen. Buddha. Penguin Books. 2001: 187. ISBN 0-14-303436-7 （英语）. Buswell, Robert E. (ed.). Encyclopedia of Buddhism. MacMillan Reference Books. 2003. ISBN 978-0028657189 （英语）. Coogan, Michael D. (ed.). The Illustrated Guide to World Religions. Oxford University Press. 2003. ISBN 978-1-84483-125-8 （英语）. Donath, Dorothy C. Buddhism for the West: Theravāda, Mahāyāna and Vajrayāna; a comprehensive review of Buddhist history, philosophy, and teachings from the time of the Buddha to the present day. Julian Press. 1971. ISBN 978-0-07-017533-4 （英语）. Juergensmeyer, Mark. The Oxford Handbook of Global Religions. Oxford Handbooks in Religion and Theology. Oxford University Press. 2006. ISBN 978-0195137989 （英语）. Lowenstein, Tom. The Vision of the Buddha. Duncan Baird Publishers. 1996. ISBN 978-1-903296-91-2 （英语）. Kohn, Michael H. (trans.). The Shambhala Dictionary of Buddhism and Zen. Shambhala. 1991. ISBN 978-0-87773-520-5 （英语）. Nattier, Jan. A Few Good Men: The Bodhisattva Path according to The Inquiry of Ugra (Ugrapariprccha). University of Hawai'i Press. 2003. ISBN 978-0-8248-2607-9 （英语）. Robinson, Richard H., and Johnson, Willard L. The Buddhist Religion: A Historical Introduction. Wadsworth Publishing. 1982. ISBN 978-0-534-01027-0. Sinha, H.P. Bhāratīya Darshan kī rūprekhā (Features of Indian Philosophy). Motilal Banarasidas Publ. 1993. ISBN 978-81-208-2144-6. Thanissaro Bhikkhu. Refuge: An Introduction to the Buddha, Dhamma, & Sangha 3rd ed., rev. 2001. Thich Nhat Hanh. The Heart of the Buddha's Teaching. Broadway Books. 1974. ISBN 0-7679-0369-2. Thurman, Robert A. F.（translator）. Holy Teaching of Vimalakirti: Mahayana Scripture. Pennsylvania State University Press. 1976. ISBN 978-0-271-00601-7. Walpola Rahula. What the Buddha Taught. Grove Press. 1974. ISBN 0-8021-3031-3. White, Kenneth. The Role of Bodhicitta in Buddhist Enlightenment Including a Translation into English of Bodhicitta-sastra, Benkemmitsu-nikyoron, and Sammaya-kaijo. The Edwin Mellen Press. 2005. ISBN 0-7734-5985-5. Yin Shun, Yeung H. Wing (translator). The Way to Buddhahood: Instructions from a Modern Chinese Master. Wisdom Publications. 1998. ISBN 978-0-86171-133-8.